In less than a month, Carol and I will be traveling to Borneo. This post has nothing to do with that trip. The pool in our condo building is undergoing some major repairs requiring a few months to complete. I’ve joined a neighborhood health club so as to be able to swim in the interim. The club is about three quarters of a mile away, so I get a bit of exercise walking there and back. Also, the pool is a good length (25 meters) and is maintained at a cool temperature, perfect for swimming laps. In addition, the club has a hot tub and steam room. So, while it’s not the same as taking an elevator down to the pool in our building, it has some distinct advantages, and I’m quite pleased with it. I have been going to the club during the week and the pool has been very uncrowded, allowing me to have a lane to myself each time I’ve gone. Today, Saturday, was quite different. 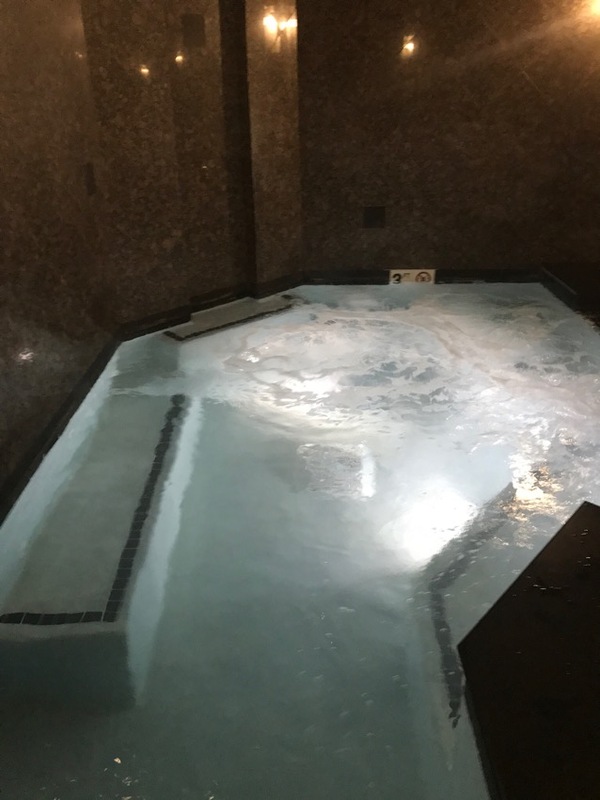 There were three people in each of the narrow lanes as I entered the pool area and I thought that I might just take a pass on swimming today and use the hot tub and steam room. While that was disappointing, it was far from the end of the world. As I approached the hot tub, I heard operatic music being piped in to the area, which I had not noticed on prior visits. The closer I came, I realized that the operatic music was not being piped in, but rather was being produced by a man (who I would judge to be about my age), seated in a corner of the hot tub, singing loudly and with gusto, at full voice in a very pleasant bass/baritone. (You may not be able to make out the man, because this photo was taken half an hour after he left.) When I asked the man what he was singing, he said that it was some church music, in Latin. He inquired as to whether his singing was bothering me and I said that it was not, that I would have let him know if it had been, but that I found it quite pleasant. He continued, singing arias in Italian and French, as well as some more popular music, such as Red River Valley. I learned very little about the man, because I did not want to interrupt his singing, but I did learn that he typically goes to another branch of this health club, so it is highly unlikely that I will ever run into him again. So, to me, he was a bit like the “lost chord divine” (though I was not weary or ill at ease, nor was I seated at the organ, and I had not produce the music myself, so I guess it was not that much like the lost chord divine, after all). After 15 minutes or so of singing, the man said that the chlorine in the hot tub was starting to bother his eyes, so he got up to leave. I said goodbye and thanked him for the recital, telling him that I had enjoyed it very much. He bowed slightly and thanked me (in Italian, of course) for saying so. Not long after that, I got out of the hot tub. By then, the pool had emptied quite a lot. I was able to share a lane with a young woman who left after I had completed about half the number of laps I normally swim, so I could complete my lap swimming with a lane to myself. I tend to think of memorable experiences that I want to blog about as events that happened on an exotic trip. Today’s experience showed me that that was far too narrow a view, that wonderful experiences are available on a daily basis all around us, if we are open to noticing and enjoying them. I am hoping to notice more. But I promise not to blog each time I notice. Thanks for your tolerance, and see you pre-Borneo. Sounds like the beginning of a novel. Thanks for a little early morning good read.